Air Awakens has been popping up a lot lately in my Twitter feed, and I knew that I wanted to see what it was all about. When I noticed a review tour was going to happen, I signed up right away and was excited to be accepted on it. 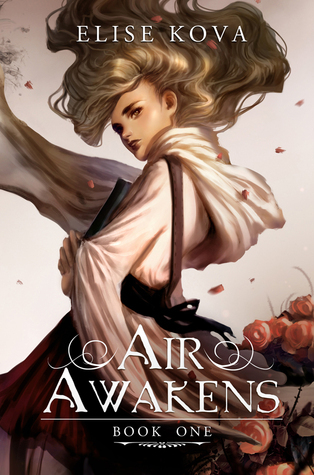 Air Awakens begins with Vhalla, a library apprentice, saving the crowned prince’s life without her knowing. While researching books for a cure, she left traces of her magic in her notes, which saved the prince’s life and formed an unbreakable bond between the two. Finding out that she has magic, let alone the extinct, elemental air, is a shock to her. She refuses to believe it until Prince Aldrik helps awaken her abilities. Aldrik then becomes Vhalla’s teacher and helps her understand magic better. Let’s start with the characters. I enjoyed reading about Vhalla a lot. She is very innocent and naive in the beginning, but I liked how by the end of the novel, she was already transforming into a strong warrior. I’m excited to see her develop even more as she goes off into war. A few of the minor characters I loved and wanted to see more off, but there were two that I sadly disliked. These two characters were Vhalla’s friends that she worked with for years, and I hated what went down between them when they found out about her magic. Also, I was frustrated when one of them expressed his feelings for her and that whole situation. Moving on, though, I loved Aldrik. I mean, who doesn’t love a mysterious, dark prince? I especially loved watching Vhalla and Aldrik’s relationship transform from apprentice to friendship to even something more. I’ll admit it, I definitely fell fast and hard for this ship, and I am a fan of the romance in this book. Although, I do wish it progressed more than it did in Air Awakens, I am excited to see it where it will go in Fire Falling. There were a few slower parts of the novel, but that is to be expected when being introduced to a new world. Parts of the pacing made the story hard to follow at times as well as the world building being a tiny bit confusing, but I was never completely lost while reading. A map would be very helpful with this world. This book takes place only at the palace in the capital city, so I am looking forward to exploring this world more in the sequels as Vhalla ventures away from the capital. Overall, this is the start to a very promising series, and I’m excited to pick up the sequel, Fire Falling. I recommend this to fans of elemental magic fantasy stories. the cover looks amazing. sounds like a perfect book for me! It was great! And, I agree, the cover is so pretty! I hope you enjoy it if/when you read it! Ah, I’ve had my eye on this book for a while and so many bloggers that I follow have written such positive reviews, so after reading yours I’m convinced – I definitely need to pick up a copy of it soon! 🙂 Great review! Oh, that synopsis! I am caught! I love magic and all aaaaaand it’s a librarian apprentice! Who would not love her? Anyway, it has never been on my Twitter radar, unlike you. + I do not like that there is even more to Aldrik and Vhalla’s relationship? But maybe, I might enjoy their romance once I have read this. Lovely review, dear! Thank you! 🙂 I hope you’ll like it if you get the chance to read it! Ohh, I’ve heard so many great things about this book! I’m glad you enjoyed it … that gave me enough reason to ad it to my “to-buy-soon” list, haha. I’m super curious about Prince Aldrik … like, I LOOOOVE princes and if they’re dark and mysterious? HECK YES! <3 Great review!! Ohhhhh I REALLY want to read this book and your review has totally convinced me XD. Glad that you loved it so much! I get when fantasy is slowish, there is SO much world building. Lovely review 🙂 have a great day! I’ve been hearing about this one a lot and I plan on reading it at some point this year. I’m glad you liked it! The characters sound excellent, though other reviews have also complained about Vhalla’s friends. I suppose I’ll just have to see for myself! The discovers-powers-and-trains is one of my favorite storylines, especially seeing just how the magic works. The cover for this book is gorgeous too!